The world of international trade is complicated — hundreds of laws, thousands of codes, a million little quirks… it’s no wonder so many people have so many questions. Even longtime importers might feel a little fuzzy on some of the details — that’s why we’re here to be the experts! Through our work, we see some questions come up a lot. 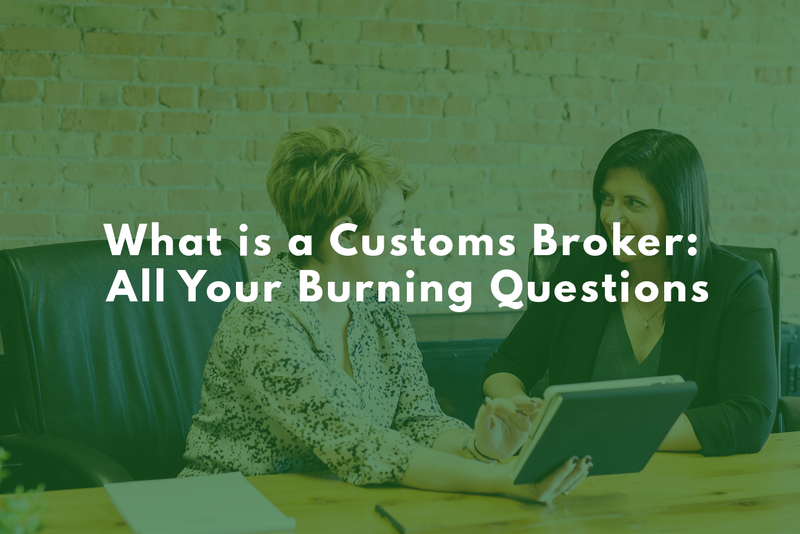 To help out anyone with those burning customs and importing questions, we put our heads together and compiled a handy list of answers for you to reference. What is a customs broker? How are you different from a shipping company with free customs brokerage services? A customs broker acts as the go-between for you and customs. We are licensed experts in customs law and compliance — we’re the ones who have the time to memorize harmonized tariff codes! By knowing customs inside and out, working with us takes the guesswork out of importing. A customs broker is an expert partner that frees you up to concentrate on other aspects of your business. As your agent, a customs broker makes importing quick and efficient. We’re experts. Companies that offer free customs brokerage service typically are not full-service experts. You get what you pay for! What are the minimum documents I need to import commercial goods? Who prepares those documents? You’ll need a complete commercial or Canada Customs invoice at the very least. The invoice should specify the shipper, purchaser, what the goods are, quantity, country of origin, and the original currency you used to pay for the goods. There are a lot of sections on the Canada Customs invoice — this is where a customs broker comes in handy. Either the vendor or you (and your customs broker) can prepare this document. You’ll also need a Bill of Lading if your goods are being shipped to you. The Bill of Lading is very similar to an invoice and has multiple sections to be filled out. The vendor prepares this document, not the importer. You’ll also need to prepare an eManifest for customs and transmit it ahead of time — your customs broker can help with this. Certain goods require additional import permits, but these are the minimum documents for general clearance. How long your clearance will take depends on the way you shipped your goods. By land is fastest; your goods can be cleared as soon as they pass the border with the eManifest system. By air is also relatively fast; once you have the airway bill, goods can be cleared before they’re available for delivery. Ocean freight has the slowest clearance time, because goods must be unloaded and on the warehouse floor before they can be cleared. Power of Attorney is a legal agreement to give another party the right to make decisions on your behalf. When you draw up the PoA agreement, you can specify the exact scope. Power of Attorney is required for working with a customs broker in Canada. There is no singular PoA document that needs to be filled out, but any PoA for customs brokerage needs to include relevant contact information, a description of what you’re authorizing the broker to do and for how long, and the effective date of the agreement. A non-resident importer is an importer who doesn’t live in Canada, but for customs business, essentially acts as though they do by being the Importer of Record. Not every importer who lives outside is a non-resident importer. You have to register as one with the CBSA, which requires a Business Number from the Canada Revenue Agency — a customs broker can help. Becoming an NRI removes barriers to trade by removing extra fees and duties from your goods. What is cargo insurance? Do I need it? Cargo insurance protects your imports against theft, damage, and loss. Carriers usually have their own insurance packages, or you can work with an insurance broker. Insurance isn’t required for importing, but frequent importers should consider purchasing cargo insurance. There are no exact numbers — no one is tracking it comprehensively — but a number of shipping containers are lost every year, and more sustain damage. Cargo insurance gives you peace of mind. How do I submit my documents to customs? In Canada, documents are submitted to customs electronically. The Advance Commercial Information program utilizes eManifest capabilities; through eManifest, customs documents are submitted prior to arrival. You can submit your documents yourself, or a customs broker can work with you. Our process is online for ease of use! CBSA is auditing me. What happens next? The first thing to know is that you haven’t been accused of any crimes. Random verification checks and CBSA audit surveys mean that perfectly compliant importers can be targeted for an audit. If you haven’t been staying on top of your compliance, audits can be stressful. The best way to deal with an audit is to have an expert ensuring all your import and export documents are complete, correct, and filed properly. Once you’ve been informed of an audit, you will have 30 days to send the CBSA their requested documents. Don’t volunteer more information than they ask for, and don’t make any additional changes to your records while you’re being audited. If you’re worried about an audit and would like guidance, you can sign a letter of authorization to allow a customs broker to work with you through the audit. As customs experts, we can guide you through the process. Cannabis is legal in Canada now. Can I travel through customs with cannabis? Can I import marijuana into Canada? Cannabis is legal in Canada, but you can’t take it in or out of the country. The border rules haven’t changed; you can’t take it with you, even if you’re crossing the border into a state that has also legalized cannabis. Hefty legal fines will follow if you get caught. Marijuana can be imported, but it is a complex process. Importers have to jump through a lot of hoops, including getting all the relevant permits and import certificates from Health Canada. Individuals cannot import cannabis for personal consumption.